A second generation fine artist, Catherine Wilson Smith studied fine art exclusively after winning the First Place Competition Scholarship to the American Academy of Art in Chicago in 1966. Her work is included in the academy’s permanent collection. 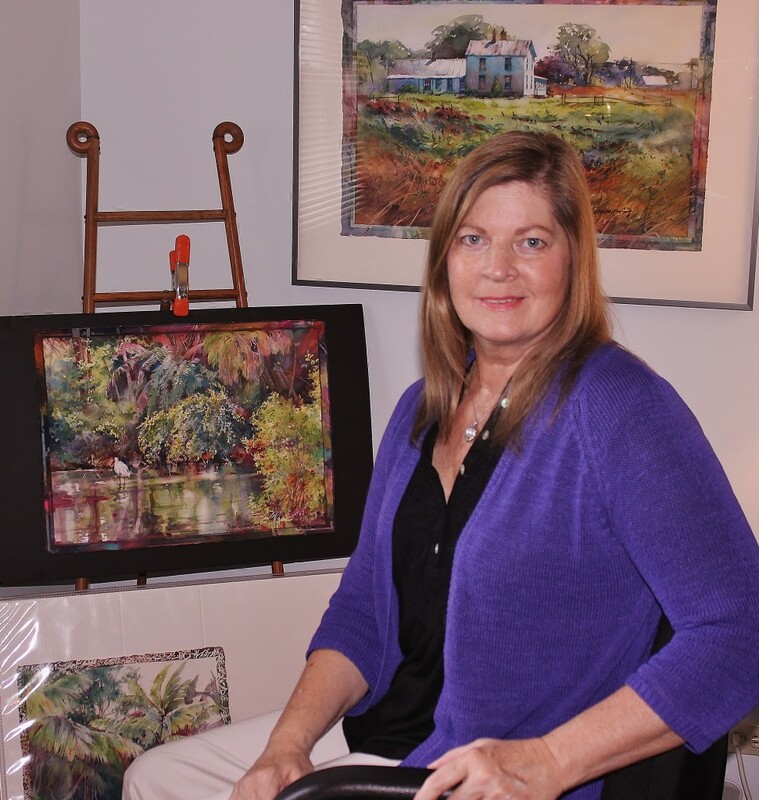 A native of Illinois, Catherine has lived and worked as a fine artist in rural Elgin, Illinois for over forty years. In more recent years she frequents southwest Florida, where tropical subjects have also made a significant imprint on her portfolio. Catherine is an honored Signature member of the Transparent Watercolor Society of America (TWSA), Watercolor West (California), the Georgia Watercolor Society, a Sustaining Member of the American Watercolor Society (New York) and an honorary member of the Northlight Watercolor Society (Duluth, Minnesota). She has been recognized as Master Watercolorist and Bronze Medal recipient of the Transparent Watercolor Society of America and in 1998 Catherine won the coveted TWSA Skyledge Award (top award). She has won many awards and/or shown in the exhibitions of the American Watercolor Society, the National Watercolor Society, Watercolor USA, Watercolor West, Georgia Watercolor Society, the Adirondack’s National Exhibition of American Watercolors, the San Diego International Exhibition of Watercolor and more. Her paintings and writing contributions are published in North Light Books’ Splash 4 1996, Rockport Publisher’s Creative watercolor 1995, Creative Art Press’ The Artistic Touch 3 1999, Quarto Publishing’s (England) Painting Light & Shade 2004, and her biography in Melrose Press Limited’s (Cambridge, England) Outstanding People of the 20th Century – 2nd edition 2000. Catherine is also published in American Artist Magazine’s Watercolor ’88; International Artist Magazine, Aug 1988; Watercolor Artist Magazine, Winter 1999 and Winter 2000. Throughout her life, Catherine’s passion for watercolor has dominated. A tour of this website reveals a host of different subjects from landscape to interiors with figures and still life. A strong sense of motion and texture show up especially in her landscapes. The rhythmic movement of skillful, confident brushstrokes seems to sweep the viewer through her images. Her paintings display a visual richness beyond the ordinary, showcasing her passion and commitment to her vision. In a 1997 feature article, one Chicago Tribune writer sites her vibrant use of colors and their juxtaposition to her paintings’ strength. Yet another writer states that her shapes and colors spring with emotionaI force from the paper. In the last few years, Catherine has integrated painted borders into the network of her images. Unexpected and sometimes surreal in effect, these edges give the viewer a sense of standing at an opening to the foreground. The Midwest and the tropics of South Florida currently serve as the primary pivot points to Smith’s work. Farm life, dusty roads and backlight are certainly hallmarks of many Smith award winning watercolors. However, a newer genre has emerged with as much passion. Igniting her brush are the tropics, the everglades and the shallows of the mangrove where the white Ibis abide. Palm fronds play against coral colored buildings and brightly colored birds are juxtaposed in dreamlike backdrops. All these visuals have now been called out to inhabit Smith’s paintings. A natural outflow of Catherine’s artistic life was the popular watercolor workshops she led across the country. For 25 years her sought after teaching skills, enthusiasm and genuine care touched countless lives. The Scottsdale Artists School (Arizona), Art Center Sarasota (Florida), Duluth Art Institute (Minnesota), Mid-Southern Watercolor Society (Little Rock, Arkansas) and Latrobe Art Center (Pennsylvania) are only a handful of the locations where she taught. Her travels during those twenty five years also provided an interesting change up to her usual painting themes. Among her favorite painting locations are the Pacific coast, Arizona, Texas, New Mexico and Southwest Florida. Yet whatever the subject, at the core of it all, Catherine gravitates to whatever evokes her earnest reaction to build an emotionally strong work.